Partners & Crime - order and shipping information for mystery and crime fiction and for collectors of modern first editions. ORDERING INFORMATION: In US dollars, by check, American Express, MasterCard, or Visa. Phone orders are accepted. Please give your name as it appears on the card, the card number, and the expiration date. New York State Residents add 8.25% sales tax. ONLINE: We continuously publish our First Editions inventory online (more than three thousand unique titles) at AbeBooks, Amazon, Alibris, and on Biblio. If you locate a book on one of these venues and elect to order from us directly, we will very likely be able to reduce the price and charge only actual shipping. 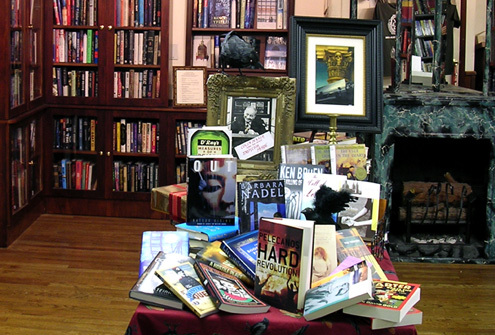 BEST HOURS TO ORDER: Partners & Crime's retail store in New York's Greenwich Village is open seven days a week. The best time to place an order by phone, allowing for time differences, is after 2:00 pm. When we are not in the shop, you can leave a message on our voice mail and we will get back to you at the first opportunity. SHIPPING: By UPS in the USA. First book $7.50, and $2.00 each additional book. Insurance is provided at Partners & Crime's expense. A street address is required as UPS will not deliver to post office boxes. For International orders, we will charge actual shipping and insurance as needed. We use USPS Global Priority mail, in order to track our shipments. All books subject to prior sale. Prices subject to change.